A quick look at the latest figures from SEER, the statistical database provided by the National Cancer Institute, shows that survival rates for most forms of cancer have increased dramatically over the past 30 years or so. Non-hodgkin lymphoma has also seen significant improvements in 5 year survival rates with an increase from 46% in 1975 to 70.2% in 2003. Breast cancer and colorectal cancer have both benefited from increased levels of screening. Colorectal screening is slightly more controversial because the most common screening method, the colonoscopy, carries a serious complication rate of around 5 per 1,000 colonoscopies. Other forms of cancer have shown little or no change in survival rates over the last few decades. While surviving certain cancers has become nearly assured, cancers of the pancreas, lung, esophagus, and liver have continued to kill at alarming rates. We normally think of lung cancer as an affliction of elderly smokers however this isn’t always the case. Lung cancer before the age of 50 is relatively rare in the United States however more than 12,000 cases still occur annually, a rate of 4.2 per 100,000 individuals per year. In the USA, lung cancer is the ninth most common form of cancer in the under 50 age group, accounting for around 6% of all cancers. The highest rate of lung cancer in the young is in Hungary with 10.9 cases per 100,000 per year in the under-50 age group. While lung cancer is more common in men than women overall, early-onset lung cancer actually occurs more often in women than men. The incidence of lung cancer in the young has declined dramatically in the United States over the past half century. The majority of lung cancer cases in the under 50 group occur in heavy smokers who began smoking in their teenage years. Some studies have found a low median age of lung cancer in HIV infected individuals who smoke, suggesting that the combination of the two risk factors may hasten the development of lung cancer. A high proportion of young females diagnosed with lung cancer are infected with Human papillomavirus (HPV), the findings are not fully explained by adjustment for smoking suggesting a role for the virus in the development of early-age lung cancer. A study of young adults in Chile found an increased incidence of lung cancer (around 7 times greater) in individuals aged 30-49 who were exposed to arsenic in utero and in early childhood. Exposure to second-hand smoke, asbestos, and radon gas in childhood have also been suggested as possible causes of early onset lung cancer. Lung cancer in the young tends to be diagnosed at a later stage than lung cancer in older individuals. When you are told you have colorectal cancer and begin looking for treatment options, you may be concerned about life expectancy and quality of life. The chart below shows the cancer survival rates of 268 metastatic colon cancer patients who were diagnosed between 2000 and 2009. Of the CTCA metastatic colon cancer patients shown in the above chart, the estimated survival rate at six months was 87%. SEER is the only authoritative source of population-based information about cancer incidence and survival in the United States that includes the stage of cancer at the time of diagnosis and patient survival data. The objective of this analysis was to see how long each group of patients survived after their diagnosis. The independent biostatistician computed the survival outcomes of metastatic colon cancer patients from the CTCA database and metastatic colon cancer patients from the SEER database who were diagnosed between 2000 and 2009. The chart below shows the cancer survival rates for a group of 362 metastatic colon cancer patients who were diagnosed between 2000 and 2011. Of the CTCA metastatic colon cancer patients shown in the above chart, the estimated survival rate at six months was 85%. At Cancer Treatment Centers of America, we understand that you may also wish to see the survival rates of the group of metastatic colon cancer patients reported in the Surveillance, Epidemiology and End Results (SEER) database of the National Cancer Institute. Therefore, we asked an independent biostatistician to analyze both the survival rates of the group of CTCA patients and the group of patients included in the SEER database. We also want to be sure you understand that cancer is a complex disease and each person’s medical condition is different; therefore, CTCA makes no claims about the efficacy of specific treatments, the delivery of care, nor the meaning of the CTCA and SEER analyses. This analysis included colon cancer patients from CTCA who were diagnosed from 2000 to 2011 (including 2000 and 2011) with primary tumor sites (as coded by ICD-O-2 (1973+)) from C180 to C189, and were considered analytic cases by the CTCA. Primary tumor sites (as coded by ICD-O-2 (1973+)), date of initial diagnosis, date of last contact, year of initial diagnosis, age of initial diagnosis, gender, vital status, and cancer histologic type as coded by the ICD-O-3. The database from the CTCA cohort was prepared by the CTCA cancer registrars from the following four hospitals: Southwestern Regional Medical Center hospital, Midwestern Regional Medical Center hospital, Eastern Regional Medical Center hospital, and Western Regional Medical Center hospital. The SEER program of the National Cancer Institute is an authoritative source of information on cancer incidence and survival in the United States. This analysis included colon cancer patients from the latest SEER Limited-Use Database (as of 2014) who were diagnosed from 2000 to 2011 (including 2000 and 2011) with primary tumor sites (as coded by ICD-O-2 (1973+)) from C180 to C189. Primary tumor sites (as coded by ICD-O-2 (1973+)), survival time recode as calculated by the date of initial diagnosis and the date of death or the follow-up cutoff date, year of initial diagnosis, age of initial diagnosis, gender, vital status, and cancer histologic type as coded by the ICD-O-3. For example, if a specific primary tumor site had patients in only one database, none of those patients were used in the analysis. Covariates such as age at initial diagnosis and year of initial diagnosis could affect the survival of colon cancer patients. We understand you may be feeling overwhelmed with questions and concerns about your type of cancer and what it all means. Explore our cancer hospitals, which house the latest treatments, technologies and integrative oncology services under one roof. Discover our patient-centered approach, and how you get all your questions answered in a single visit by a dedicated team of cancer experts. This entry was posted in Anti Angiogenesis, Chemotherapy, Surgical Therapy and tagged Affordable Life Insurance, Cancer Lung, Cancer Smoking, Cancer Survival Rate, Chemo Therapy, Dr William, Improvements, Insurance, Lung Cancer, Smokers, Ted, William Li. This is Gerson Therapy, however Gerson said not to take the drugs and get the chemo as they will only kill you and make it harder for natural fresh raw fruits and vegetables to help your body combat and in almost every case cure even terminal cancer. Persecuting Gerson Therapy is a big deal in the USA even if there are clinics popping up all over the world, if I got cancer it would be off to Mexico, Japan or Sweeden if I didn’t feel I could manage the diet on my own. Recommended BookRead more about food that fight cancer in this book, available from Amazon. The following article provides a brief overview of the prevalence, causes, and survival statistics for lung cancer in younger people. A smoker has around a 1% chance of developing lung cancer before the age of 50 while a non-smoker’s chances are less than 1 in 1,000. The majority of lung cancer cases diagnosed in the young are adenocarcinomas, a form of non-small-cell lung cancer that arises from the glandular tissue of the lung. This is primarily due to a large number of heavy smokers in the country who often begin smoking at a very early age. In 2008, there were 25 cases of lung cancer in children aged under 15 in the USA and 1,144 cases worldwide. As can be seen from the graph below, the decline has been much greater in males than in females. This is probably because lung cancer is rarely suspected in younger age groups leading to delays in diagnosis. At Cancer Treatment Centers of America® (CTCA), we believe you have the right to know our statistics for colorectal cancer treatment outcomes, so you can choose the best cancer care for you and your family. Therefore, we asked an independent biostatistician to analyze the survival results of CTCA® patients. This means that six months after their diagnosis, 87% of the patients in this group were still living. Therefore, we asked the same independent biostatistician to analyze both the survival rates of CTCA patients and those of patients included in the SEER database. Therefore, SEER is currently the most comprehensive database for the analysis of CTCA results and national results. Our fifth hospital, located near Atlanta, Georgia, was not included because it was not open to patients until August 2012. In both cases, the patients had been diagnosed with metastatic or distant cancer – cancer that had traveled from the primary site (colon) to one or more distant sites in the body where it continued to grow. These factors significantly reduced the size of the CTCA sample, which means that the estimates reflected in the survival chart may be subject to high variation and may not be replicated in the future when we have a larger CTCA sample for analysis. Not all cancer patients who are treated at a CTCA hospital may experience these same results. This means that six months after their diagnosis, 85% of the patients in this group were still living. SEER is a source of population-based information about cancer incidence and survival in the United States that includes the stage of cancer at the time of diagnosis and patient survival data. The independent biostatistician computed the survival outcomes of metastatic colon cancer patients from the CTCA database and metastatic colon cancer patients from the SEER database who were diagnosed between 2000 and 2011. More specifically, the SEER Limited-Use Database contained a combination of three databases. The survival outcome from the SEER database was provided by the SEER Limited-Use Data File as the number of completed years and the number of completed months. Formal statistical analyses of the colon cancer survival distributions between the CTCA database and the SEER database were conducted by the nonparametric logrank test and Wilcoxon test as well as the likelihood ratio test. Similar estimates were also computed to estimate the difference of the survival rates at these time points between the two cohorts. Therefore, additional adjusted analyses were completed on the survival outcomes between the CTCA and SEER samples after adjusting for the effects of these covariates. First, although a large cancer sample was available from the SEER program across many geographic regions in the United States, both samples, including the sample from CTCA, are convenience samples. I highly recommend the Gerson Therapy book and there are tons of resources online about it. 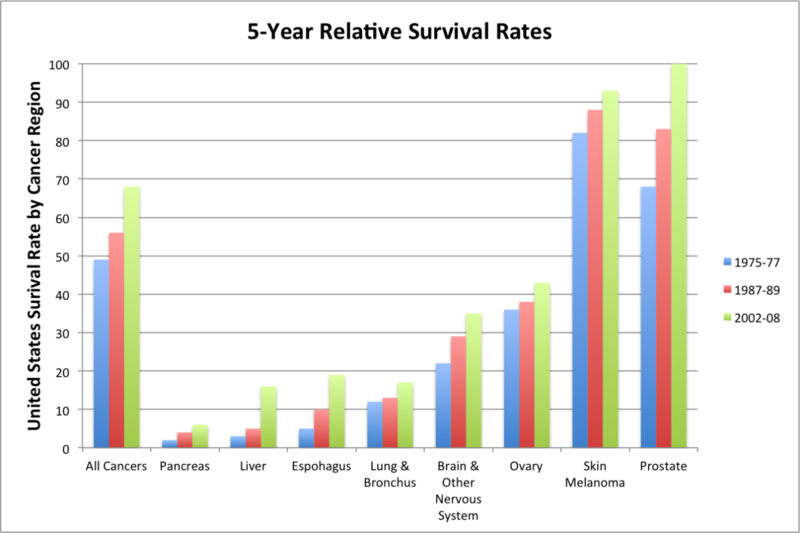 The following graph shows 5-year survival rates for some of the most common forms of cancer. Rituximab is one such monoclonal antibody which targets B-cell non-Hodgkin lymphomas and can lead to significant increases in survival rate when used in conjunction with chemotherapy regimes. In the case of lung cancer, mesothelioma, and pancreatic cancer, patients often don’t become symptomatic until the cancer is well advanced. There exists a statistically significant disparity between all races and African Americans, for all cancers, 1975-77, 39%, 1987-89 43%, and 2002-08 60%. A 1999 survey of secondary school students in Budapest, Hungary, found that a massive 46% of 15-18 year-olds were current smokers with almost a quarter of them smoking at least 11 cigarettes a day. Childhood lung cancer rates are higher in developing countries however this may be the result of mis-diagnosis where cancer at another site has metastasized to the lung. In 1975, males aged under 50 were almost twice as likely to develop lung cancer as females. Around 8% of lung cancers in the under 45 age group are stage-I at diagnosis compared to 15% of lung cancers in the over 45 age group. SEER collects information on cancer incidence, prevalence and survival from specific geographic areas that represent 28% of the population of the United States. In both cases, the patients had been diagnosed with distant (metastatic) cancer as discussed above. The SEER Program is a comprehensive source of population-based information in the United States that includes stage of cancer at the time of diagnosis and patient survival data. Patients whose age at initial diagnosis fell into the overlap of the two ranges from the CTCA and SEER samples were included in the survival analysis. These were then converted to the number of years by dividing the number of total months by 12. Because the estimated survival curves might not estimate the survival probability at these specific time points, survival rates from the closest observed survival times were used. The nature of these convenience samples prevents a causal interpretation of the statistical inferences. As a result, the cancer has often metastasized and there is little hope of long term survival, even with modern treatments. The gap has closed steadily over the last 30 years and in the early 2000s, the male rate actually dropped under the female rate. There is also some evidence that lung tumors in younger people tend to be faster growing and more aggressive than in older people. This means the cancer had traveled from the primary site (colon) to one or more distant sites in the body where it continued to grow. Second, although some types of matching, as described above, were implemented to select the appropriate SEER and CTCA comparison samples, the distributions of important covariates such as age at initial diagnosis, race and year of initial diagnosis were not exactly the same between the CTCA sample and SEER sample. Because patients surviving more than five years remained part of the risk sets in the estimation of survival rates at any time within five years of diagnosis, the truncated survival curves were identical to the first portion of the complete survival curves. Hence, even with the adjusted analyses, the possible confounding of these factors to the analyses and results cannot be ruled out. Another Cox proportional hazards model was also used to simultaneously adjust for the effects of both covariates (age at diagnosis and year of initial diagnosis) in the survival analysis. Third, the survival analyses was based on the statistical comparisons of the rate of death from all possible causes, not solely the cancer-specific death. Data from CTCA are not available for a statistical comparison on cancer cause-specific death rates. 11.06.2014 at 14:37:25 Look like a con just because they come again watermelon) to the exotic, there are quite a few. 11.06.2014 at 19:48:44 Warning signal for a more serious problem ? ?like coronary real outcomes with a minimal.